Since I was born in 1994, the Cleveland Browns have made just one playoff appearance. That was in 2002 when they were the sixth seed in the AFC and ended up losing their Wild Card matchup to the Steelers. To put it lightly, the Browns have been one of the worst franchises in all of sports over the past two decades. The root of the Browns problems begins with the Quarterback position. From Tim Couch, to Kelly Holcomb, to Jeff Garcia, to Trent Dilfer, to Charlie Frye, to Derek Anderson, to Brady Quinn, to Colt McCoy, the Browns have struggled mightily in finding a franchise Quarterback in the past decade. Enter Brandon Weeden a second year Quarterback out of Oklahoma State. The Browns took the 29 year old with the 22nd overall pick in the 2012 NFL Draft with intentions of him bringing the Browns offense back to relevance. Weeden underperformed in his first season throwing for 3385 yards, 14 scores, and 17 picks. The Browns brought in former Browns/Panthers Offensive Coordinator Rob Chudzinski as their new Head Coach. Weeden is flourishing under the new regime this preseason. He has thrown for 229 yards, 3 TD’s, and 0 INT’s through two preseason games. Although his success will be instrumental to the Browns success, he isn’t the focal point of the Browns offense by a long shot. 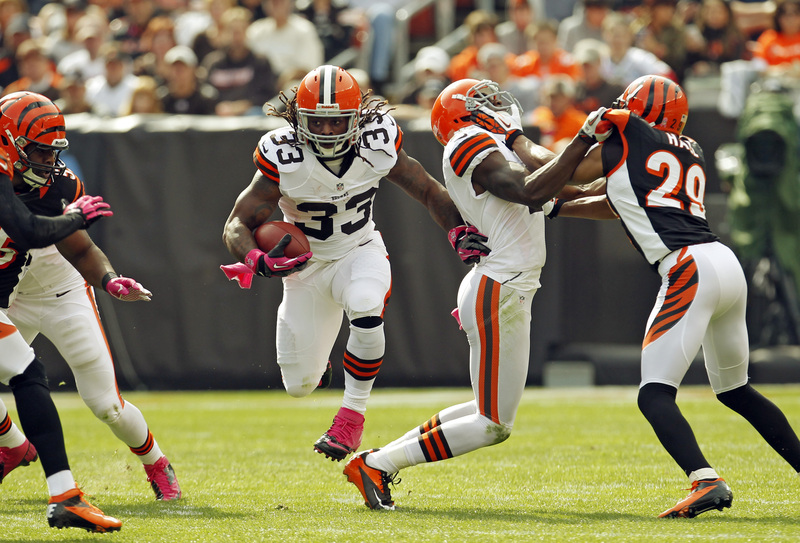 Second year back Trent Richardson out of Alabama is poised to be a top 5 Running Back this season. Richardson is a compact back weighing in at 5’9 and 230 pounds and the third overall pick in the 2012 Draft. It was a disappointment that he didn’t surpass 1000 yards rushing this past season, but he did find the end zone 11 times. This season, look for Richardson to rack up around 1200 yards rushing and 12 touchdowns. With a year of experience under his belt he will make a case to be considered elite this season. The Browns will be greatly improved this year. They added studs Paul Kruger and Desmond Bryant who will both be important in their transition from a 4-3 to a 3-4 scheme. Unfortunately, they play in the best division in the AFC. Automatically playing three Super Bowl contenders twice a year will take a toll on the Browns. They shouldn’t win too many games this season but fans should be excited to see how Weeden and the new defensive front fair in this new regime. Since the Browns only had three picks within the top 175, the 2013 draft wasn’t one to remember. To be honest I didn’t really like the draft as a whole. The sixth overall pick of Barkevious Mingo makes sense, but it is also somewhat of a head scratcher. Was Mingo worthy of being the sixth pick? I don’t think so. He’s an athletic freak of nature and has unlimited potential, but he also didn’t produce much last year. Mingo only recorded 38 tackles. Also, he played off the edge as a Defensive End so that makes me wonder if he can fare as an Outside Linebacker. I’m sure he’ll have no problem but I think a player like Sheldon Richardson who could come in and dominate as a five technique opposite Desmond Bryant would have been more fitting. In the third round, the Browns selected CB Leon McFadden out of San Diego State. McFadden is a solid lockdown corner and should prove to be serviceable across from Joe Haden eventually. Corner was a big need so getting McFadden in the third was a great pick up for the Browns. I would have liked to see them take a risk on Tyrann Mathieu though. Overall, the Browns draft wasn’t too exciting but hopefully these players can contribute to an up and coming team this year. Week 1 Vs. Miami- Two rising teams playing in the season opener should make for a shootout. This test will set the tone for the rest of Cleveland’s season. Week 12 Vs. Pittsburgh- The Browns beat the Steelers at home last year and have a good chance at repeating this year. A win against the mighty Steelers towards the end of the season could provide some momentum for Cleveland down the final stretch. 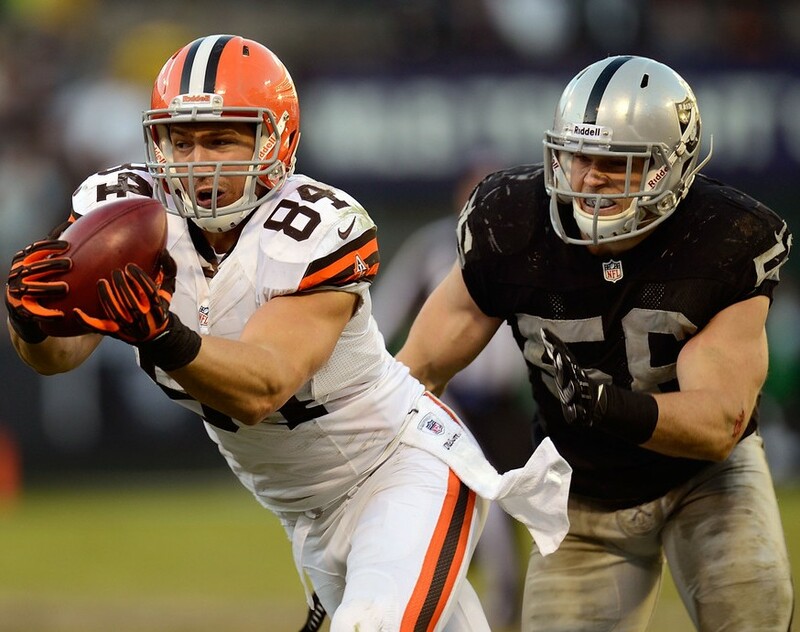 After starter Ben Watson left via free agency, Jordan Cameron has emerged as the clear cut starter for the Browns. Like Jimmy Graham and Antonio Gates, Cameron is a former college basketball player turned Tight End. During this preseason he has been very effective lining up in the slot. He has seen five targets in which he has caught four for 72 yards and 2 TD’s. Cameron’s freakish athleticism and size will help him succeed this season. He has developed a chemistry with QB Brandon Weeden as well which will also contribute to his success. As I stressed in the opening paragraph, the Browns Quarterback play has been arguably the worst in the NFL over the past decade. Although the preseason isn’t a great indication of how the regular season will play it out, it does a good job of showing if a player has improved. Weeden has been playing very well in the preseason, but can it carry over to the regular season? 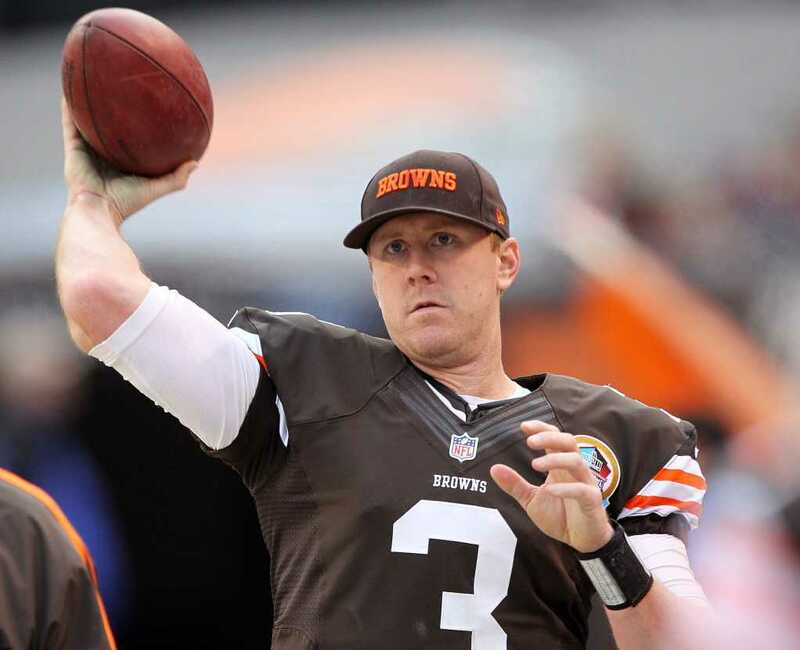 I think with a cast of reliable targets like Jordan Cameron, Josh Gordon, and Greg Little and Trent Richardson to balance the passing attack, Weeden will be consistent this season. If everything can fall in place, the Browns have the potential to push for a Wild Card spot. Tagged 2012 NFL Draft, Alabama, Barkevious Mingo, Brady Quinn, Brandon Weeden, Cleveland Browns, Colt McCoy, Desmond Bryant, Jordan Cameron, Josh Gordon, Paul Kruger, Rob Chudzinski, Steelers, Super Bowl, Trent Richardson, Tyrann Mathieu.